We can’t wait for our Graduate Conference this weekend! 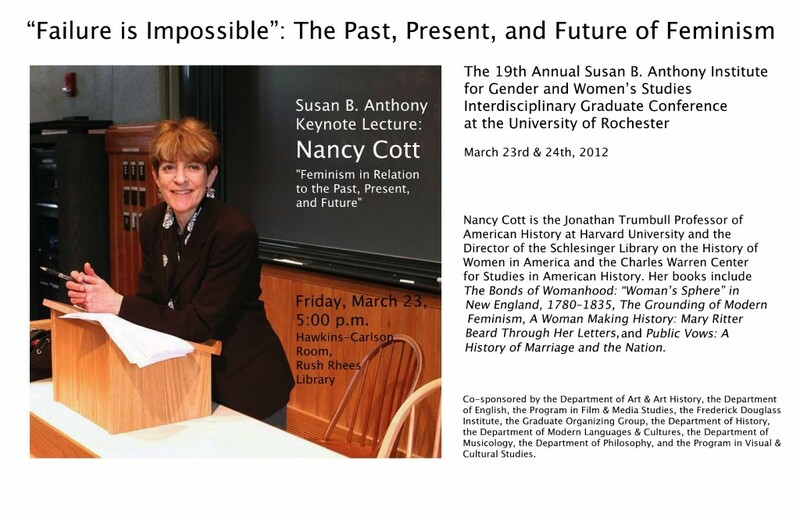 Professor Nancy Cott, Director of the Schlesinger Library on the History of Women in America at Harvard University, will open the conference on Friday March 23 at 5pm in the Hawkins-Carlson Room of the Rush Rhees library when she delivers the annual Susan B. Anthony Keynote Lecture. Her talk is titled “The Past, Present, and Future of Feminism,” and ties in well with SBAI’s 25th anniversary theme. Saturday is full of panel discussions with graduate students from local, national, and international universities. You can view a full conference schedule on our website. The conference runs on Saturday March 24 from 10:15am to 5:30pm. A special thanks to the graduate conference planning committee for there efforts in organizing what is certain to be an informative and enlightening weekend. This entry was posted in SBAI Events and tagged #conference, #SBAIgrads, #womenshistorymonth. Bookmark the permalink.